The first commercial airliner was the de Havilland Comet I. It was designed and built in Hatfield, Hertfordshire, United Kingdom in 1949. The de Havilland Aircraft Company was a leader in aircraft design and manufacturing having excelled with the building for such fighter planes as the Spitfire, Mosquito, trainers like the Chipmunk (I first learned to fly this plane in the RAF), Gipsy Queen, Dove, Heron and many more fine aircraft. The Comet I was thoroughly tested in the UK and around the world. It was assigned a certificate of airworthiness and went into commercial business around the world. Then came two catastrophic accidents and the plane was taken from commercial use. Months of detailed testing revealed that these planes had a major metal fatigue weakness. The designers insisted on square windows to make sure it did not resemble a ship's pothole. It was a mistake. A crack occurred from one of the windows to a dome on the top of the fuselage. The dome was used for shooting star navigation with a sextant. (no GPS in those days). 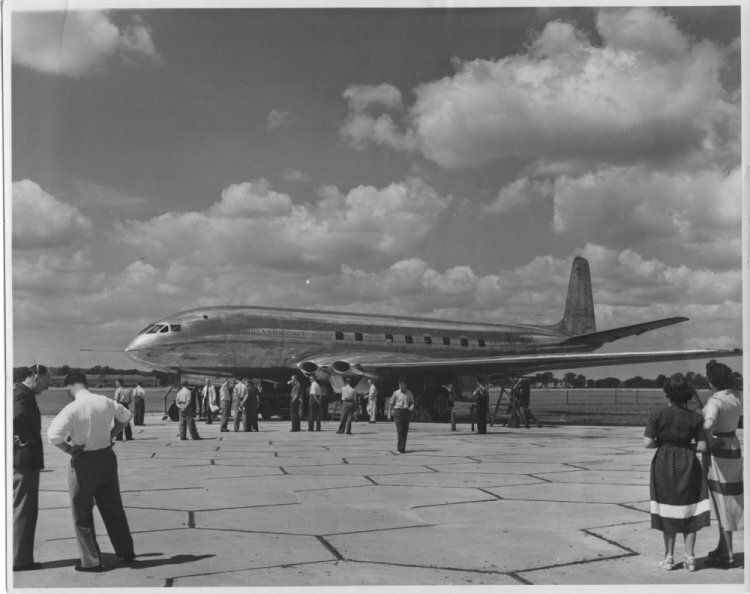 This is a picture of the first commercial jet airliner on the day it rolled out onto the apron in 1949. Please notice the square windows. 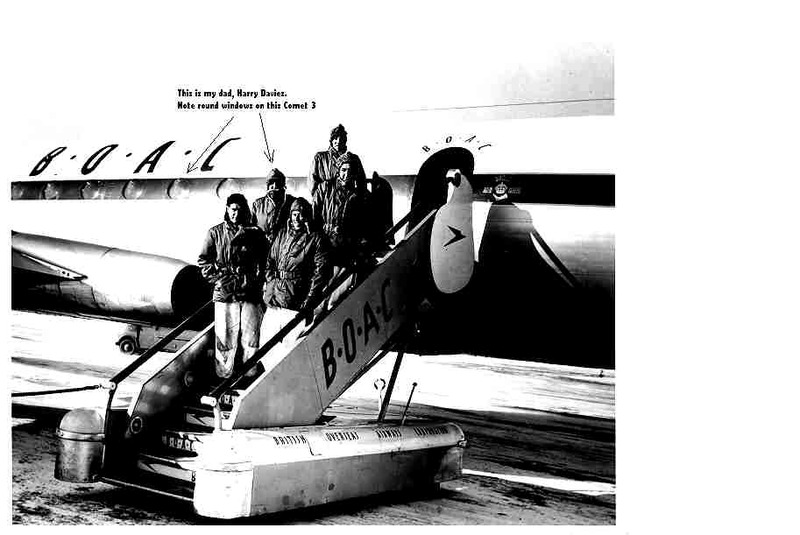 My father is under the nose of the plane --- highlighted! What a magnificent handsome plane! Would be good looking even in 2001. Please notice the round windows on the Comet III. The new plane was fine but it had lost its reputation. The Boeing 707 came along and took over the market. Comet conducting tests under very cold conditions in Canada. My father is second from the top. More discussion in my book. This photograph was taken in Nairobi in about 1949. My father was there testing the Comet I under extreme heat conditions. Please note the square windows. This is a copy of the certificate given to my father after he crossed the equator in the first commercial airliner, the Comet I, G-ALVG, at 9:45 AM on April 25, 1950. It is signed by de Havilland's famous test pilot, John Cunningham. This trip was to Nairobi. Comet I on world marketing tour in 1949. 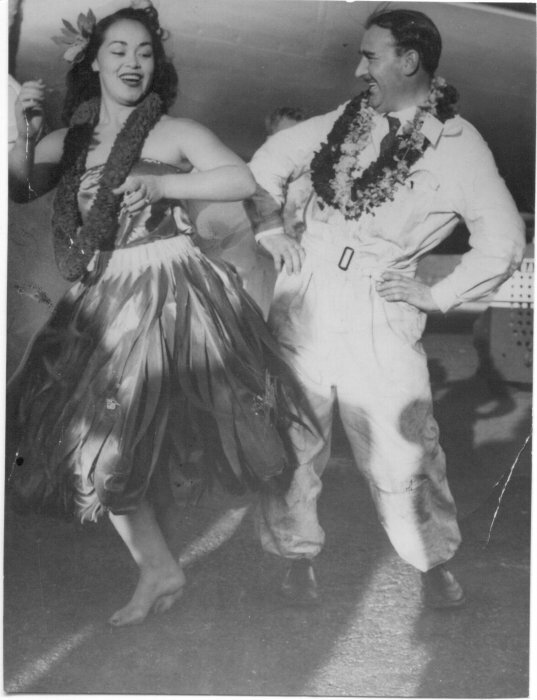 Honolulu welcomed the chief flight inspector; my father. 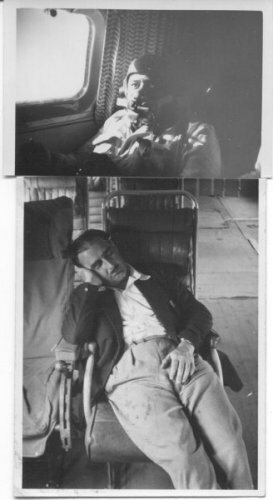 Please note the conditions under, which the crew traveled around the world in 1949; oxygen masks and hard seats. The cabin pressure was only 2.5 psig, which probably saved my father's life. When the commercial planes went into service at normal passenger pressure of about 8.5 psig the metal failed from these square windows to the dome fitting. Note the square window. These men were pioneers and should be respected as such. Much of what was learned in the Comet I was passed onto Boeing, which built the Boeing 707 soon thereafter. This is a photograph of the new Comet III with the new round windows. 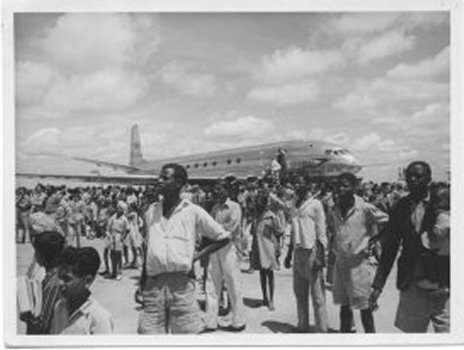 These planes went into commercial operation and was a modest success. The Boeing 707 came into operation and dominated the market and was a great success. Sir Geoffrey de Havilland wrote an autobiography called, "Sky Fever" and I have included four pages of this book as it describes what happens when a pressurized cabin breaks up and I thought his words from the 1960's would be more appropriate than mine. Page from Sir Geoffrey's book. He discusses the problems with the Comet I. Read these two pages and understand what happens when an aircraft breaks up in mid-air. The most interesting part describes the noise on the Cockpit Voice Recorder. The Comet III was a magnificent and beautiful plane. My father, Harry Davies, died on June 13, 2001. He was 89 years old. In my opinion, like the unknown soldier, he was one of the first unknown aviation pioneers, having been involved with the DeHavilland Comet 1 experimental team and having flown around the world in an experimental aeroplane which had serious metal fatigue problems. He was a chief inspector on these flights, making sure that the aeroplane met the specifications of airworthiness, according to the design. 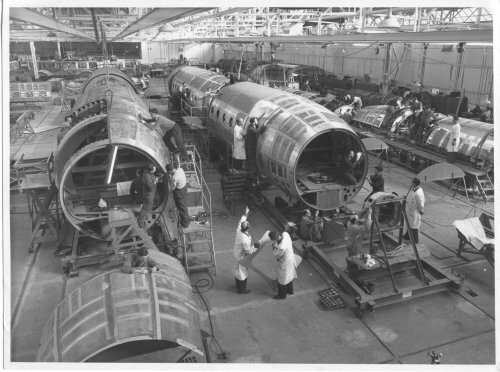 The Comet 1 went into commercial operation and, within a short period of time, two had crashed. My father was part of the investigation team which determined what had caused these crashes.